Getting calls at 8pm to be in room by 5 am. Yup, this happened again. Last minute rescues to replace due to emergencies is part of our world sometimes, and I was glad to help an old contact on this Pharmaceutical show. This is my forte, quick to adapt and fast to learn the show in its current state. All day show and then creating content and photo recaps for the next day event, made for a very first long day. The result was a great event with a happy client for the hard word of learning everything very quickly and adding valuable knowledge and skill set to an already working team with a desperate call to fill in. 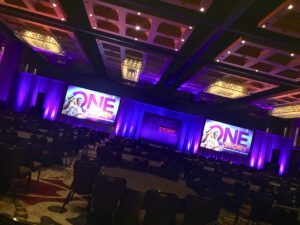 This entry was posted in Corporate Event, Graphics Production, Las Vegas Production, Pharmaceutical, Powerpoint/Keynote Show Operator, Presentation Graphics. Bookmark the permalink.